Thou art I and I am thou. Thou hast established a new bond. It brings thee closer to the truth. Persona 4: The Animation is a 25 episode Action/Drama/Mystery/Comedy series based on the video game from Atlus. Studio AIC and director Seiji Kishi are responsible for the series with Sentai Filmworks holding it’s current license in the states. Additionally, there is a Persona 4 recap film and an OVA episode. They were released in June and August of 2012. 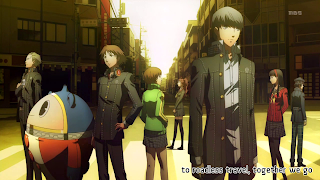 Yu Narukami has moved from Tokyo to Inaba to stay with his uncle and cousin, while his parents are away on business. However, after a murder shakes up the sleepy town, things get even more crazy when he discovers the mysterious "Midnight Channel," and that he has the even more mysterious ability to enter TVs. Accompanied by his disbelieving friends, Yu discovers another world inside the TVs, that seems to be connected with the murder. 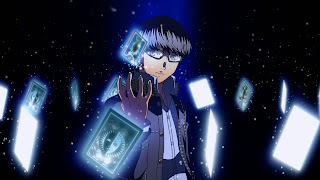 They also discover the ability to summon 'Persona', their 'other selves', whose power they can use to fight the shadows that inhabit the TV world. The murders, the Midnight Channel, the world inside the TV, and Persona. Yu and his friends fight to figure out how they're connected, and to solve the case before it's too late. I don’t think I need to say a whole lot when it comes to the art style here. It’s about 98% stunning and 2% sloppy. The sloppiness comes from the character designs in the early episodes, but gets picked up more as the series rolls on, and especially with the second season. The soundtrack for the series is pretty much a copy paste from the video game. It’s a nice touch, but there aren’t many songs I would want to listen to again, except for the opening themes and the first ending theme. I think if I made a top 50 list of opening themes, at least one of those themes would be hiding in there somewhere. Other than that, there’s nothing really notable here. I’m not saying it’s a bad thing, but I’d be repeating myself again about how wonderful the animation is. If you wanna see something similar to that, then I think my Shiki review will be a close enough fit. 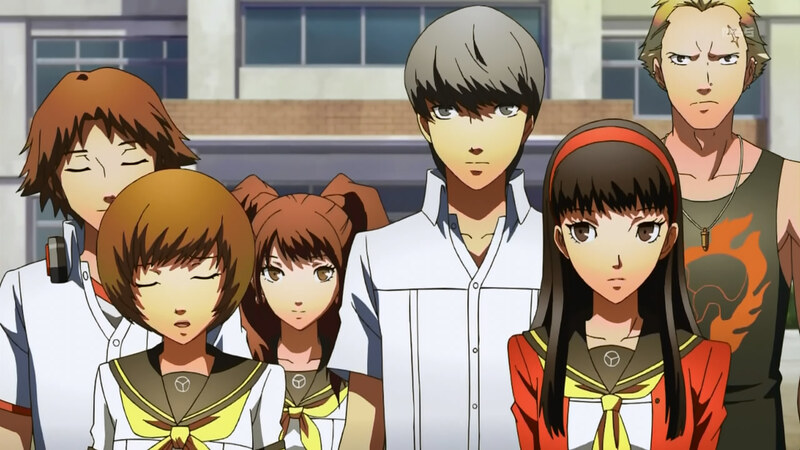 The story of Persona 4 is just a simple high school murder mystery comedy with magic. I never really played the games or have been a fan of the franchise. But I did take a look at a good amount of Let’s Plays online to get an idea before watching the series. What I get from it, story wise, is a lot of copy pasting. It’s not a bad thing. Being true to your source material can be seen as a major plus. However, following it almost to the letter may make it into something bad. Why am I saying this? Because close to two thirds of the series is just filler. In the game, one of the major points is to create bonds and turn them into Social Links in order to create powerful Arcana. They follow this too well in the series, giving at least one person an episode that is focused on that friendship Yu creates. This isn’t quite a good thing because you’ll get people who haven’t played the video game, get upset because the series is just playing around with people. 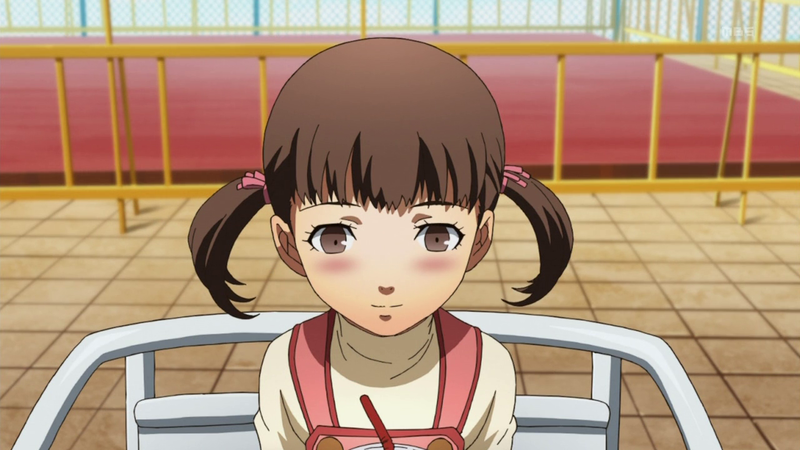 But there are some episodes of filler that are really memorable, such as the Dojima/Nanako episode in the later half of the series. Overall, the story could use a little less filler and a bit more meat. I want to say there’s character development in the series, but it’s only to a certain extent. 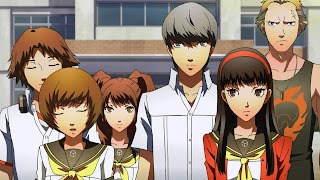 The only real development most of the minor characters have (Yosuke, Chie, Yukiko, Kanji, Rise, and Naoto) is through gaining their Persona’s in the TV world. 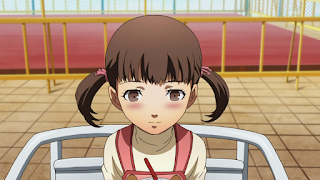 Then you have a couple characters like Dojima and Nanako with similar amounts of development. 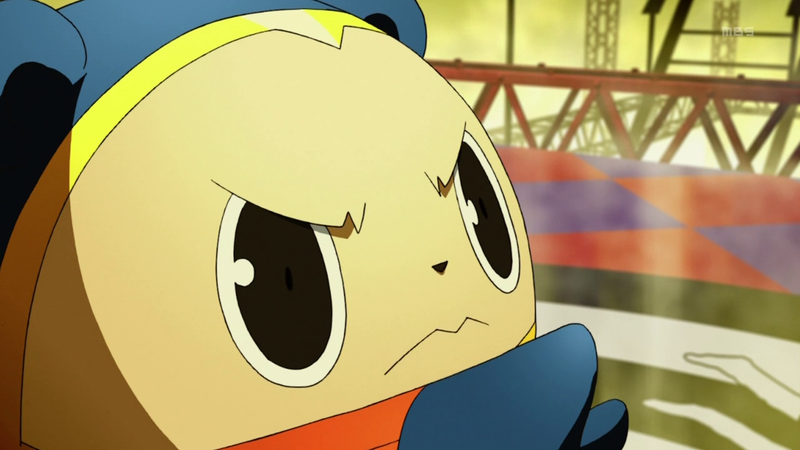 The two characters with the most development of the series are Yu and Teddie. 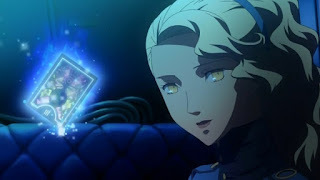 Teddie questions himself, wondering who he is and tries to search for his memories, while in the process gains his own Persona and a human body. As for Yu, I’ve never quite seen this kind of development done in a series or film. At the beginning of the show, Yuu is a clean slate. No personality what so ever, almost an empty shell. However, as the series rolls on, he gains skills and bonds with his friends that finally give him his personality by the end of the series. How this can be measured is through the cut away bits mid episode where they show Yu’s growth. This process is similar to that of the original video game. Sadly, this still makes Yu rather dull for a good 2/3s of the series. It’s only during the show’s climax at around episode 20 or so, that we get a more likable person. As for the rest of the characters, they each bring something different to the table; sometimes as a certain stereotype. The ones prominent in the stereotype area being Yosuke (the goofball best friend), Kanji (the bad boy with a good heart), and Rise (the popular girl who doesn’t want to be as popular). 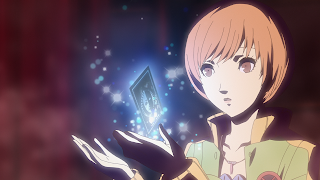 As for Chie, Yukiko, and Naoto, they were really interesting to watch a grow as the series continued. Overall, some good ideas are here, but not executed extremely well. 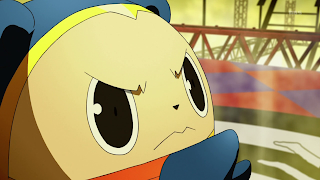 Teddie is such a lovely bear! Sentai Filmworks had an amazing time with the dub! When I went to Anime Boston last spring and sat in on their panel, it was announced that they were in the works of getting the cast of the video game to reprise their roles for the dub; with Johnny Yong Bosch (Trigun, Last Exile) already in to play Yu and Adachi. I gotta say, I kind of enjoyed Bosch’s Yu. Granted he made the blank personality great, but all the humor in the show that comes from Yu almost reminded me of Vash the Stampede from Trigun; which is kinda a good thing. Yuri Lowenthal (Durarara! !, Tiger and Bunny) jumps back in as the goofball best friend Yosuke and I gotta say, it was a lot of fun! Some of his comedic moments are perfect, along with Yosuke’s occasional stupidity (way to go with them swords, dude). Someone I didn’t quite expect in the dub was Mary Elizabeth McGlynn (Cowboy Bebop, Ghost in the Shell: SAC) as Naoto. You barely even notice it, at first, until the group goes into the TV. I think her performance was decent, but nothing all that amazing. Now, Kanji Tatsumi’s VA is an interesting subject. Troy Baker (Soul Eater, One Piece) reprised his role for the first half of the series and then was taken over by Matthew Mercer (Fate/Zero, FMA: Sacred Star of Milos). Why this happened I have no idea, but I didn’t notice much difference. This makes it a plus for Mercer since he was replacing someone. As for the rest of the major characters: Erin Fitsgerald (Ranma 1/2, Kekkaishi) was okay as Chie, but I would have loved to see her original VA from the video game; Amanda Winn Lee (Ghost in the Shell: SAC, End of Evangelion) as Yukiko was pretty enjoyable; Laura Bailey (Soul Eater, Fruits Basket) as Rise is, well, Laura Bailey; and then we have Sam Regal (Fate/Stay Night, Paranoia Agent) as Teddie, which was a ton of fun to listen to! Even with all the bear puns! The last four people I want to give mention to are J.B. Blanc (Hellsing Ultimate, Monster) as Dojima, Karen Strassman (Code Geass, K-On!) as Nanako, Michelle Ann Dunphy (K-On!, Magical Girl Lyrical Nanoha) as Margaret, and Dan Woren (Fate/Zero, Dracula: Sovereign of the Damed) as Igor. All but Dunphy were really good in their roles and were a lot of fun to listen to. As for Dunphy, it’s not that I didn’t like her, she just felt wooden at times. Oh Johnny... Please play more Vash like roles. I miss them. Now I can imagine there being a lot of love and a lot of hate for this series. The love coming from the fanboys of the franchise, and the hate from some of the casual gamers and pure anime watchers. Here’s the thing. When you try and adapt a book into a movie, you’re not going to have room to put in all the details. As a result, the extreme fans of that book will potentially go on a rampage and calling the film crap because it left out some details that the book had. On the flip side of it, when you make a very very faithful adaptation of a book, the casual movie goer won’t be happy because either a) the film didn’t use their material properly and made it into a mess or b) it’s not original. In the case of Persona 4 hate, the reason seems to be the later of the two. I can understand it not being original and have it follow the entire game series almost to a T, but I can also appreciate the effort that was put into this series. It took it’s source material, that being a video game, and made it into a pretty well thought out and executed series. How often do you see a video game, I repeat a VIDEO GAME, adapted this well? I’m guessing never. No, visual novels don’t count. 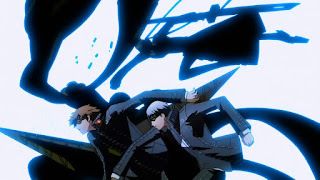 When fog has lifted, Persona 4: The Animation is a near exact adaptation of the video game, making it both a blessing and a curse. The animation is stunning and the majority of the dub cast was a fun listen. The downside, however, is the loads of filler and failed character development for the lead character. If you’re a big fan of the franchise then there’s no way I can stop you from watching the series, and, more than likely, you've already watched the series. As for the casual watcher, give it a try only if you like the amount of humor in the show (seeing as how it’s my big saving grace). And if you’re not a fan of extreme filler and dull lead characters, then you might not want to watch it. Next time,we see what review #50 has in store for us!. Until then, otaku on my friends!